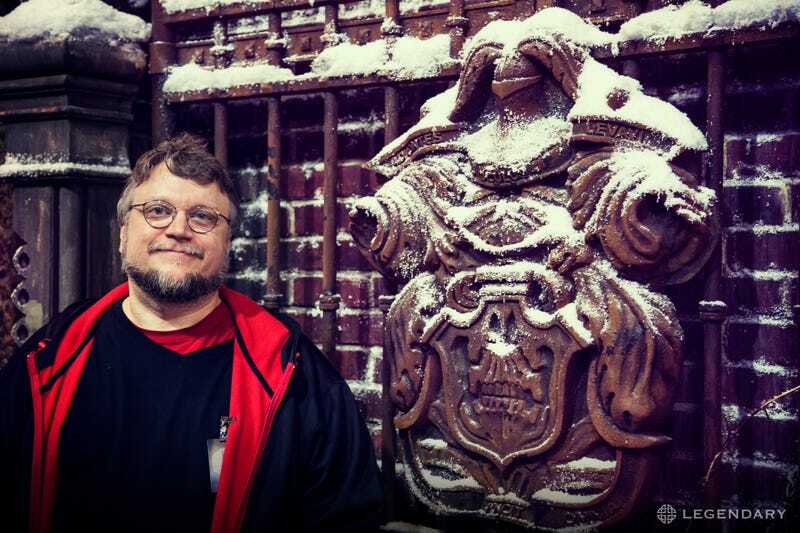 Tucked away on the massive convention floor inside Comic-Con, Guillermo del Toro built a miniature version of his haunted house from his upcoming Gothic horror story Crimson Peak. And then proceeded to give personal tours of his tiny terror. It was amazing. Watch! First up, apologies for the quality of this footage. It's not great but I was crowded in the room with a couple other journalists and there was no light (for spookiness) etc., etc. However ,you can totally see all the amazing props and (most importantly) hear GDT talk about what you're looking at and all the work he put into creating this itty bitty Crimson Peak set (a movie centered around a brother, and sister played by Tom Hiddleston and Jessica Chastain, respectively, and their newest family member Mia Wasikowska, who plays Hiddleston's brand new blushing bride). [Transcribed from the video] "If the big house [on set in Toronto in Crimson Peak] was a banquet, this is like finger food. It's much smaller but it has the same flavor. We have the portrait of the mother [the original gigantic version GDT had hand painted for the se now sits in his own home Bleak House in LA]." "What is great is, hopefully some people will come in late and they get to do the whole exhibit aloe. It gets really creepy when you walk this area alone. I designed this booth myself with Guy Davis. I spent about five weeks designing the experience, the screams, the shot over there [in the corridor]. I designed the way we were going to display the props to tell a story. I wanted this whole thing to be like a little performance piece, where you walk in and hopefully people will spend time saying 'What do you think that is?' You can put together a story with the boning knife, the dead butterfly, the ring — hopefully they tell a little story — there's the butcher knife at the bottom." "I wanted to select two pieces of wardrobe that show the level of craftsmanship that was put into creating the movie. It's the first time that I'm able to reconcile the sort of painterly sensibilities of the European movies that I do, the adult themes in an American. So I want people to get a sense of how this is very, very close to the poetic, fairy tale horror that is in Pan's Labyrinth, Devil's Backbone and so forth. And I think the exhibit is that." "This [white dress] is Mia's [Wasikowska] costume; that's Jessica's [Chastain]. We have echoes from the architecture in the lace. She's sort of captured in the house. In the whole movie there's the idea of butterflies and moths you can even see it in the fabric. We have them hidden in the furniture and inside the house. You can see the butterfly and the moth." "We hand-crafted this [the blue-lit video hallway] to be exactly like the set in the corridor but miniaturized." And here's another video with close up looks at each little diorama (which GDT admitted is set up in a similar way to his "Bleak House." Outside the Legendary booth on the floor. And finally, one high-resolution image of the creepy Crimson Peak crest.